Great! You found us! Whichever road you are traveling, if you want that road to be gluten free then we can probably help you. Perhaps you or your family member haven’t been diagnosed yet and you want to find out more about why people eat gluten free? We have the resources you are after. New to the UAE? Been here your entire life? Want to meet people just like you? Yes, we can help there too. Want to know where to buy the best gluten free bread, cake, pasta? Yes, you guessed it, we can help 🙂 Need a recipe to make a great snack to put in your child’s lunch box? Need to know which brands of soaps are gluten free, cereal…? Yes yes yes, we can help with all of it and we are happy to! Have a click through the website using the menus on the left. Our blog is under News which in itself has its own menu on right hand side (categories). When you are done, make sure you join us on Facebook and Twitter, for live, interactive help from our hundreds thousands (!!) of members. Thats right, hundreds thousands of people, in the UAE, just like you.We are always in need of help, so please get in touch if you want to get involved or if you are a company able to offer sponsorship. Please remember that we are entirely non profit and run from a desk in a living room for no pay what so ever! نحن دائماً في حاجة للمساعدة، لذا يرجى التواصل معنا إذا أردت مشاركتنا أو إذا كنت صاحب شركة ترغب بعرض الرعاية للموقع. نؤكد لكم بأننا مجموعة غير ربحية ونعمل من مكتب في غرفة المعيشة دون أجر! hi there, my name is antonette an i need some help, do you know any laboratory who can do celiac testing without referral from a doctor??? I suspect that my 3 year old son is sensitive to gluten, but i have been to several pediatricians and none of them recommended blood tests to check celiac disease or gluten sensitivity. Even though I enumerated symptoms similar to celiac disease. Today we visited another doctor because he have rashes all over his body since yesterday but only prescribed anti-allergy medicine without any blood tests done. I even requested him if total IgA test can be done but he denied saying rashes does not always point to gluten allergy. I also contacted a german clinic listed in your website but was told I should bring him to a pediatrician. Thank you. Thank you linda. Will update you. Thanks a lot. I’m a gluten free chef pastry looking for a job. I can EBN you ??? i can’t but thank you for the great effort and work you put into this…many people have probably thought about doing something similar to support the cause but only a few did…I am a diabetic and it was hard to adapt in the beginning, but when i read about celiac disease I couldn’t but imagine how much more difficult it is to live with the disease…YET…it’s possible with the right knowledge and resources… i’m making a study and your website provided me with so much information and data I could use….I am just wondering if you could possibly provide me with the numbers of people suffering from celiac around the UAE and where can I get those numbers from….you are highly appreciated. Hi, I have been (just recently) diagnosed with coeliac disease as well as acid reflux. I am looking for a good nutritionist who could help me with my diet and my constant head – and stomach aches. Any information would be greatly appreciated. Is the enzyme Glutanease available in the UAE ? You can find it in gluten free supermarket or organics shop ?? Skinny Genie is a 100% gluten free bakery…. you can find gluten free bread in al lulu supermarket. Livwell UK brand. Many kinds of bread with good taste. Hi..just stumbled upon this amazing website! I have been hypothyroid for the past 16 yrs…since moving to DXb 4 yrs ago, my symptoms started getting worse..I have been gluten free last 2 months and the difference I feel mentally and physically is amazing. Ofcourse it is quite hard, esp as I am frm India and man I miss those naans rotis and parathas! But its worth the positive health I feel for it. Hi Linda , I have a son with special needs .He has ADHD and autism and recently he also have been having blood in his stool. I just did his food intolernace test and he is intolerant to wheat and casein really need help how to go about the diet.Pls can I get your email id. Neelam, you can contact admins via the facebook page. Please do not go gluten free until your son has had the celiac profile done, the intolerance test is not the one you need. I need to buy gluten free products (flour, pasta, and etc) in order to prepare food to my child. Which hypermarket or special shop you can recommend in Dubai? Please tell the ones who has the most big gluten free departments with lots of products. By the way, my son diagnos is autizm. classic one. Is there a tip how to start educating these people? My sister’s daughter is 5 years old. She was diagnosed with coeliac disease and acid reflux when she was two. My sister wants another baby now. Is it possible that the other child can also have the same disease? Tests revealed that her father possess the genes for this disease though he shows no symptoms. Thanks. Hi, My name is Sherry I am the Marketing and Communications Coordinator of Pizzaro. We would like to invite you for the opening of our 100% Gluten Free Restaurant in Tourist Club Abu Dhabi that caters Authentic Italian Cuisine we also have Gluten Free Bakery Products. Please let me know how we can arrange this for you. Where can i find gluten free soy sauce in Abu Dhabi (1st choice) or Dubai (2nd choice? Thanks! Hello, I’ve been Gluten Intolerant for a while now and was wondering if there is any decent GF bread that is soft enough without reheating it? For example I just want to make a decent sandwich for my lunch at work! Come and experience wide range of organic and gluten free products in Lulu Al Barsha. SO happy to find this service. I manage a support/playgroup for families with special needs in RAK. We could use your services greatly! Please contact me: tonyandmariepatterson@hotmail.com. Thanks! I have celiac disease. Where can i find nuts and beans gluten free. Hi, I have recently seen some new Gluten Free Products in Dubai Geant Supermarket Ibn Battuta Mall. I am always looking for new GF products. Hope you all check them out and enjoy! Hello, I’m looking for a gluten free natural almond meal, not the find powder. Anybody would know? Hi I have been recently diagnosed with celiac where can I get list of foods that are safe to eat . Like what ketchup or nuts or tomato paste. Also are we allowed rice and corn because I read that some celiacs might not be allowed rice too. Would you happen to know how many people Celiac disease effects in the UAE? 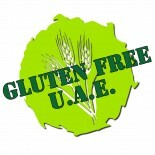 Do you have any statistic related to Celiac disease or gluten free food in the UAE? I am looking at potentially doing a little bit of voluntary work and I’ve just found your website care of Expat Woman. My husband has just been diagnosed as lactose intolerant, coeliac as well as many other intolerances so your website is of great interest to me! Can you please let me know what kind of help you are after so I can see if I would be of use to you. Hello, could anyone please tell me where I can buy in Abu Dhabi, organic coconut flour and tapeoka flour. This is for Paleo lifestyle eating plan. Thanks for the insights. I enjoy fresh gluten free foods, and generally prefer health drinks and salads ( Wagamama, Palm is a good choice) .. but your blog was helpful. Kindly suggest me a very good doctor in dubai for gluten checkup. I m being suffering from this problem. Thanks for this great web site !!!!!!!! Can anybody tell me, is Mocca Cooler from Caribou Coffee gluten free ??? Hi, can anyone tell me where I can find gluten free honey nut cheerios?